Because lifestyle is such a broad category, encompassing everything from celebrity to beauty to fashion and fitness, women have many choices about where to discover and enjoy video content. As part of the POPSUGAR Insights/ulive 2014 lifestyle video study, we asked women to share the specific types of sites they visit to find online videos dedicated to lifestyle content. Overall, social media sites like Facebook (60%) and video sharing sites like YouTube (54%) are the most popular places for women to discover lifestyle videos. 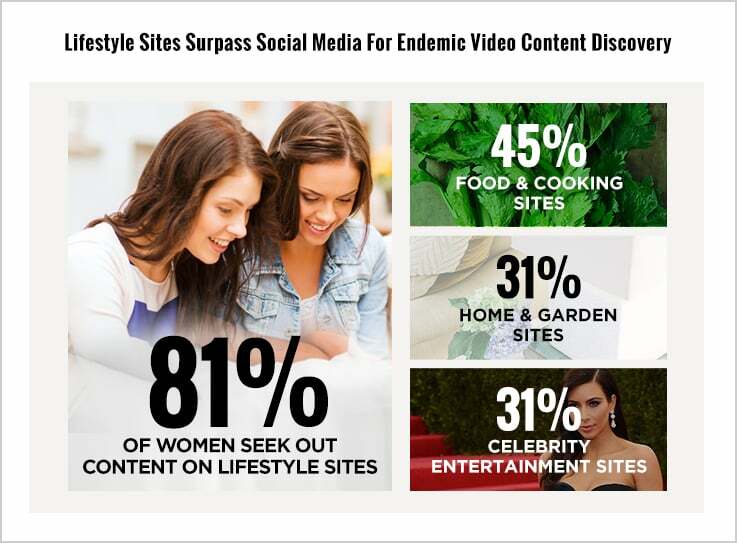 Collectively, 81% of women seek out video content on lifestyle sites and among sites with specific categorical expertise: food and cooking websites (45%), home and garden sites (31%), and celebrity entertainment sites (31%) are popular places for women to discover lifestyle videos. Broadcast TV streaming sites (32%), subscription streaming sites like Netflix or Hulu (31%), and news sites like CNN (31%) are also popular locations for women to discover lifestyle content. Among women who expressed that they were very interested in specific lifestyle categories, entertainment enthusiasts were slightly more likely to discover lifestyle video content on social media sites (63%) and video sharing sites (56%), while travel enthusiasts were slightly more likely to discover lifestyle content on a subscription streaming site like Netflix or Hulu. Among women who are heavy streamers of lifestyle content (240+ minutes per month), social media (59%), video sharing (59%), and food and cooking sites (47%) are just as popular as with women overall. Subscription sites like Netflix (41%), news sites (39%), and celebrity entertainment websites (38%) are more popular.